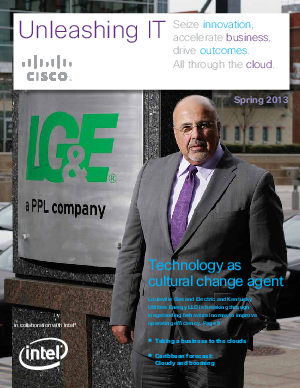 > Cisco > Unleashing IT: Seize Innovation, Accelerate Business, Drive Outcomes. All through the Cloud. Not long ago, if you asked an IT executive about transformation, there was a good chance you’d get a technology-centric response. You’d hear about consolidation and virtualization, power and cooling, security and availability. Today, the responses are different. This edition of Unleashing IT is all about transformation. Not technology change, but business change through the use of technology. Over time, the nature of transformation has, well, transformed. Instead of technology advances for technology gains, companies have learned they can use IT to reduce costs, create efficiencies, and solve problems. And many forward-thinking organizations are finding that opportunities for transformation are much broader and more impactful.